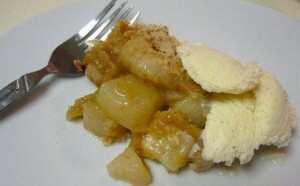 This is a wonderful substitute for apple pie. You can leave the peel on Asian pears to increase nutrients and save time. Additional mix-ins such as fresh or dried cranberries, pecans or almonds could be included as well. Quick and delicious! Preheat oven to 375 degrees F. Coat baking dish with nonstick cooking spray. Peel Asian pears and dice or cut into slices. Melt margarine in a small bowl in the microwave. In a medium bowl, combine all ingredients except Asian pears. Stir until well blended. Place Asian pears in a 9 x 13 baking dish and spread oat mixture on top. Bake about 45 minutes or until desired brownness. Serve with vanilla bean ice cream.